Joe Smith, a frequent contributor to DCI.org last year, will be contributing essays to DCI.org on a regular basis. I'm surprised that the medical world does not recognize tour withdrawal as a medical form of depression. It hits many of us every year, almost always during winter. Symptoms generally include the craving to eat off of a semiconverted truck into a kitchen, talking to yourself in the shower, the desire to sleep on a school gym floor and the craving of a peanut butter and jelly sandwich right before meals. It's about that time of year where everything is getting stressful (finals at school, holidays, work, etc. ), the preseason is in the process of starting and you're really missing that hot sunny weather, long rehearsals and even bus funk. Yes, I even miss bus funk right now. It seems to be pretty common around this time of year for tour withdrawal to hit. For me, it hit very hard this week when I actually had the chance to sit down and watch the tour video from the 2004 season. I suddenly felt the urge to just drop everything and get on a bus and just go to the next housing site. Personally, I have found there to be several ways of dealing with tour withdrawal. Since everyone experiences a different degree of tour withdrawal, I have found that the best treatment is to experiment mixing and matching treatments to find the perfect combination. During times of tour withdrawal I find myself watching a lot more drum corps, almost twice as much as usual (which is already a lot). This will generally be my best remedy when it comes to coping with the rough times that I have when not on tour. Another great thing is revisiting tour photos, and with today's wonderful technology, other people are able to make their photos available as well. For the last two years I have managed to take about six or seven rolls worth of pictures, so that during the off-season I have plenty to remind me of those great times we all have on tour. It also helps to remember some great stories that you might have forgotten about. 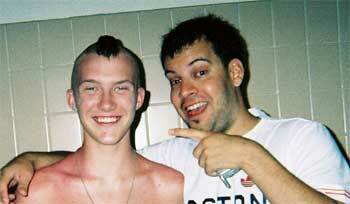 In fact, I had forgotten some of the pictures that were taken -- including one of me with a Mohawk haircut taken right before move in. Joe Smith (left) and Steve Beatty. Talking with friends who are going through similar symptoms also helps. Since we are all busy, it's hard to stay up on the daily lives of others that we once lived. So taking the time to find out how they've been and to reminisce about the good ol' times on tour can help ease the pain of withdrawal. Talking to people from other corps helps as well, which affords the opportunity to exchange stories from the season, because we can all relate to each other.